Just one week after John McCain finally generated as much campaign coverage as Barack Obama, the parity proved to be short-lived. For the eighth time in nine weeks, the presumptive Democratic nominee substantially outdistanced his Republican opponent in the competition for exposure, according to PEJ’s Campaign Coverage Index. Obama was a significant or dominant factor in 78% of the campaign coverage from August 4-10 compared with 53% for McCain. That is almost identical to the 79% to 54% lead in quantity of coverage Obama has accumulated since the general election campaign began in early June. Last week, the major story lines turned more to issues—particularly energy policy—discord among Democrats and the search for vice-presidents. Indeed, even as Obama regained a comfortable lead in the quantity of coverage, certainly some of it was ominous for the Illinois Senator’s campaign. Hillary and Bill Clinton resurfaced in campaign news last week—combining as significant or dominant factors in 23% of the coverage—and with them, so, too, did the festering subject of party unity. By week’s end, the Clintons’ role and the issue of a divided Democratic party had accounted for 12% of the campaign coverage studied. There were two major components of the narrative about discord. One was Bill Clinton’s interview with ABC, in which he appeared to betray residual bitterness about the primaries and Obama. At the same time, new questions surfaced about whether Hillary Clinton supporters want a convention roll call. The Campaign Coverage Index is produced weekly by the Pew Research Center’s Project for Excellence in Journalism. The biggest campaign theme of the week was the increasingly heated debate between the two candidates over energy policy and gas prices. That subject filled 23% of the newshole studied. This marks the highest level of coverage for any specific policy issue since the general election campaign began in June when Clinton suspended her campaign. Added together with significant coverage of differences over the economy (4%), Iraq (2%) and several other subjects, policy debates accounted for about 31% of the campaign newshole studied last week. Coverage of the veepstakes for both candidates was another major campaign narrative last week, filling 10% of the coverage, most of it focused on McCain’s list of potential running mates. And for the moment, it seemed to be Minnesota Republican Governor Tim Pawlenty’s turn to become the hot topic of speculation. Several other storylines last week also suggested problems for Obama in addition to the unhealed primary wounds and the specter of a fractious convention. One was coverage of campaign polls (6% of the newshole), which tended to focus a tightening race and Obama’s failure to build on a small lead over McCain. (“Obama Stalls in Public Polling” was the headline of a Politico story on Yahoo! News). Another was whether voters were suffering from “Obama fatigue.” That coverage followed a Pew Research Center for the People & the Press poll in which 48% of Americans said they had been hearing too much about the Illinois Senator. And a third was continuing criticism that Obama is running a “presumptuous” campaign. That idea gained traction following a much-quoted Washington Post column by Dana Milbank that appeared after Obama’s trip abroad and called him the “presumptuous nominee.” Those three storylines together accounted for 9% of the campaign coverage studied. Last week’s campaign news also highlighted the episodic nature of coverage in a race that seems to frequently change focus, at least from the media’s perspective. 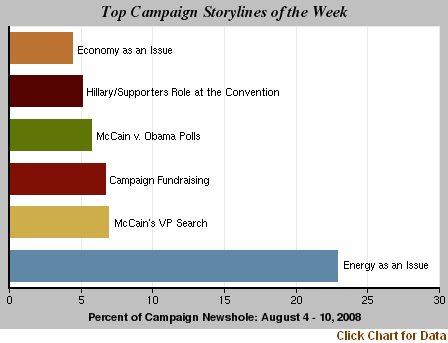 For the week of Aug. 4-10, the top storyline was the energy debate at 23%. The previous week that subject showed up in only 3% of the coverage. Two weeks ago, the biggest media theme was the campaigns playing the race card, which filled 15% of the newshole. Last week, that narrative registered at less than 1% of the coverage. 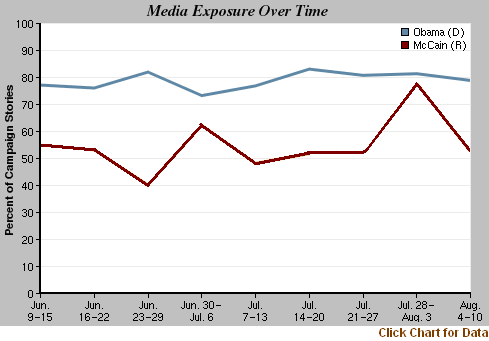 Overall, the presidential campaign accounted for 24% of the newshole for the week of Aug. 4-10, as measured by the PEJ’s News Coverage Index. That represents the lowest level of coverage of the campaign in eight weeks. Indeed, the election was the No. 1 story in only three of the five media sectors last week—with the Olympics topping it in newspapers and online. Once again, the campaign was most extensively covered on cable news, with that subject filling 47% of the airtime studied on cable last week. But the week’s hottest political story may have been the resurrection of an issue that has never been completely extinguished after the long and bitter Democratic presidential primary. Will the Obama and Clinton camps be in harmony by the August 25 opening of the Denver convention? Last week, at least, the answer was unclear. An Aug. 7 story on NBC’s nightly newscast focused on whether that convention might include a vote that would, to Obama’s embarrassment, reflect the closeness of the delegate count. That question was posed even more bluntly in a segment of MSNBC’s Aug. 6 Hardball Show. After former Clinton White House press secretary Dee Dee Myers said that “tension still exists” between Clinton and Obama forces, the show aired Bill Clinton’s interview in which he stopped short of affirming Obama’s readiness to be President. “I look at that and I see an angry, resentful guy,” guest host Mike Barnicle said. The Aug. 8 start of the Beijing Olympic Games quickly generated major coverage last week, making it the No 2 story behind the campaign, at 11% of the newshole as measured by PEJ’s News Coverage Index. It was the top story in newspapers (13%) and online (15%). Next came coverage of terrorism (at 6% of the newshole studied) a story driven by the conviction and sentencing of Osama bin Laden’s former driver, Salim Hamdan. The No. 4 story (at 4%) was a political scandal that broke late in the week. Former Presidential candidate John Edwards’ admission that he had had an affair outside his marriage validated an allegation pushed hardest by the National Enquirer supermarket tabloid and ignored by much of the mainstream press. The fifth-biggest story (also at 4%), was the continuing fallout from the suicide of anthrax suspect Bruce Ivins.